Have you seen the gorgeous pack of Journaling Tags in the new Holiday Catalogue? They match perfectly with the other products in the Season of Style range, and also work in will with the 8x8 album, but I love to use them on good old 12x12 layouts too! Makes putting a page together super quick and easy! 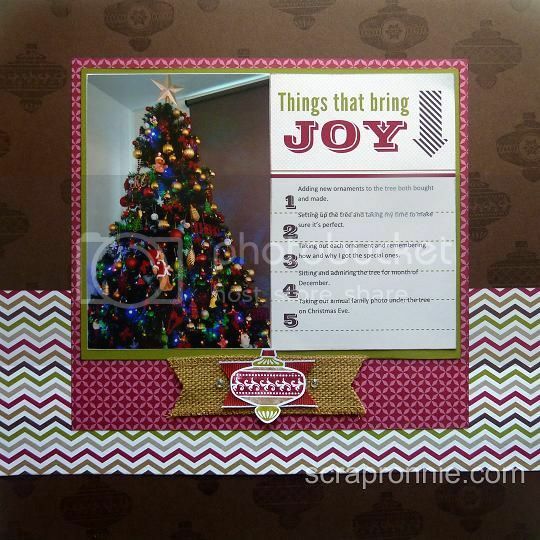 Materials: Season of Style Designer Journaling Tags (132808), Season of Style DSP (132340), Choc Chip cardstock (131187), Old Olive cardstock (106576), Whisper White cardstock (106549), Christmas Collectibles stamp set (131772), Christmas Ornament punch (132152), Cherry Cobbler Stitched Edge Ribbon (132135), Burlap Ribbon (132140), Rhinestone Jewels (119246), Versamark ink (102283), Neutrals markers (131261), Old Olive marker (100079), Cherry Cobbler marker (119681).